Boston: BAARD, 1980. 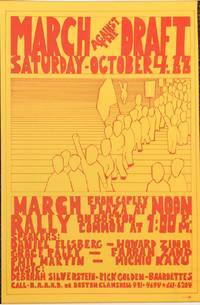 11x17 inch poster, very good, promoting an event that featured Daniel Ellsberg, Howard Zinn, Grace Paley, Michio Kaku and others. Boston: Committee for the Vindication of Sacco and Vanzetti, 1959. Hardcover. 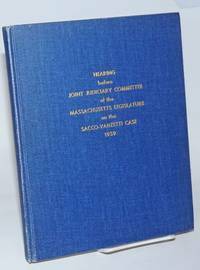 168p., very good condition, three page carbon copy of a statement by Representative J. Cella laid in, short gift inscription on front blank pastedown else very good condition. 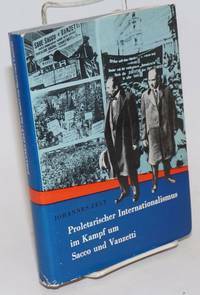 Berlin: Dietz Verlag, 1958. 391p., illus., paper begining to brown, corners bumped, else very good condition in a shelf worn dj. Text in German. 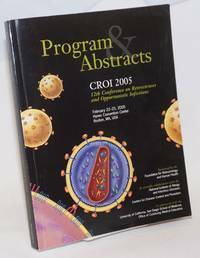 Alexandria, VA: Foundation for Retrovirology and Human Health, 2003. Paperback. 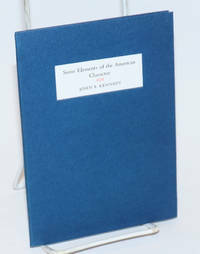 xviii, 439p., 8.25x10.75 inches, general information, program, abstracts, participant index, subject index, program-at-a-glance, floor plan of the Center, very good large paperback in blue wraps. 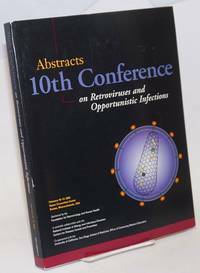 Alexandria, VA: Foundation for Retrovirology and Human Health, 2005. Paperback. xvi, 468p., 8.25x10.75 inches, general information, program, abstracts, participant index, subject index, program-at-a-glance, floor plan of the Center, very good large paperback in blue wraps. By Dickinson, Stephen & Gwen Worley, editors and contributors, Linda T. Lombardo, Alan Dugan, Miriam Goodman et al. Provincetown: The Work Center Press, 1974. Paperback. 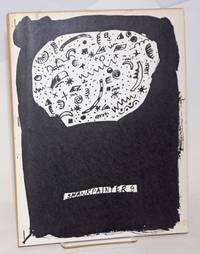 88p., 8.5x11 inches, poetry and fiction very good mimeographed poetry journal in stapled pictorial wraps. Mattapan Station, Boston: Hammer & Steel, 1962. 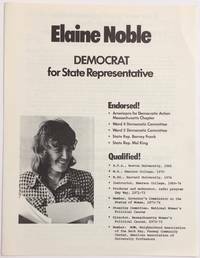 8.5x11 inch handbill, toned, folded into thirds for mailing. Attacks the Kennedy Rail Commission and calls for unity with the Teamsters. "We can see now that the attacks on Hoffa are part of the attack on ALL transport labor. Homer Chase, a former Maoist, created Hammer and Steel under the organizational name of the New England Party of Labor. [Framingham, MA], 1973. Single issue of the rank-and-file newsletter directed at railroad employees, especially those at the Penn Central Transportation Company. Printed one side, all text, 8.5x14 inches, horizontal fold, otherwise very good. 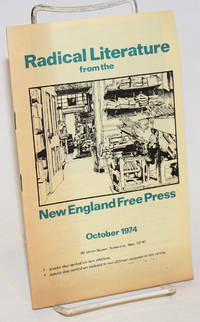 The newsletter, its production, and contents are described at some length in Chapter 9 of "Two Communist Brothers from Washington, New Hampshire and their Fight Against Fascism" by Donald H. Forbes. [Framingham, MA], 1973. Seven issues of the rank-and-file newsletter directed at railroad employees, especially those at the Penn Central Transportation Company. 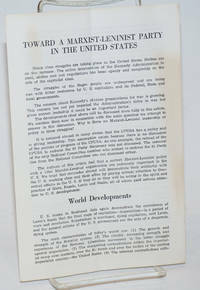 All issues are one page, either 8.5x11 or 8.5x14 inches, some toning and mild handling wear. Topics range from internal union politics of the UTU to global issues and racism within the labor movement. 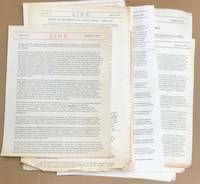 The newsletter, its production, and contents are described at some length in Chapter 9 of "Two Communist Brothers from Washington, New Hampshire and their Fight Against Fascism" by Donald H. Forbes. Issues present are nos. 18, 21, 22, 23, 31, 32 and 35. [Framingham, MA], 1972. 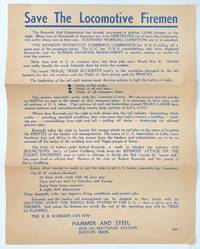 Nineteen issues of the rank-and-file newsletter directed at railroad employees, especially those at the Penn Central Transportation Company. All issues are one page, either 8.5x11 or 8.5x14 inches, many with edgewear, handling soil or uneven toning; no. 14 is rather tattered but still intact. Topics range from internal union politics of the UTU to global issues and racism within the labor movement. 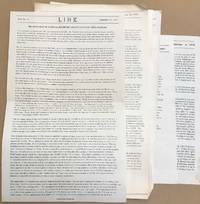 The newsletter, its production, and contents are described at some length in Chapter 9 of "Two Communist Brothers from Washington, New Hampshire and their Fight Against Fascism" by Donald H. Forbes. No. 15 has a handwritten note on the back to Fred [Chase]. Issues present are nos. 10, 14, 15, 18-23, 25-27, 29-35. Cambridge, MA: The Hard Times, 1974. 8.5x11 inch handbill, mimeographed text both sides, toned. On the case of Clarence Anderson, a Black motorcyclist beaten by police until he was blinded in one eye, and other recent local incidents. 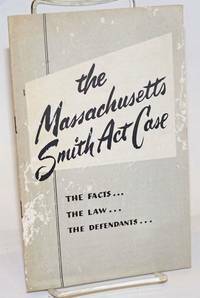 Roxbury, MA: Massachusetts Smith Act Defendants' Committee, 1956. Pamphlet. 10p., wraps, 5.5x8.5 inches, staples rusting, silverfishing on covers, else good condition. Defense statement with seven photo portraits and brief biographies of the accused. Cambridge, MA: The Hard Times, 1973. 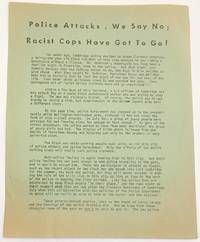 Four issues of the radical newsletter for public housing tenants; 10 to 12 pages each, 8.5x11 inches, some toning and minor wear. 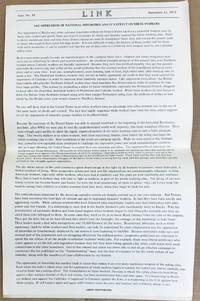 Much discussion of local racism; includes a photo of a racist note warning that the office of these "nigerlovers" would be burned to the ground. The title comes from Frederick Douglass: "You who would yourself be free, must strike the first blow. Somerville, MA: New England Free Press, 1974. [16p. ], staplebound pamphlet, covers toned with minor silverfishing. Catalog of literature for sale. Boston: Hammer & Steel, 1962. Six-panel leaflet, vertical fold crease. Undated, but quotes a 1962 article, mentions President Kennedy, and cites a recent slaughter in Algeria (probably Oran). Homer Chase, a former Maoist, created Hammer and Steel under the organizational name of the New England Party of Labor. This leaflet laments the revisionism of the Communist Party USA and calls for a new organization to promote Marxism-Leninism. Boston: Massachusetts College of Art, 1991. Paperback. 88p., 11x8.5 inches, paperback, illus., very good condition. Exhibit catalog for the exhibition of the same name at the Massachusetts College of Art, Boston, March 6 - May 4, 1991. 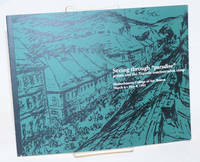 Reproductions of the art works by internees at the Terezín Concentration Camp are in both color and black and white, and accompanied by essays about different aspects of the camp and internees' cultural activities. 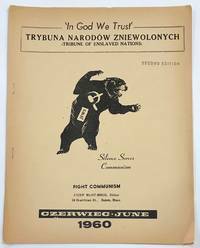 Salem, MA: [Polish Freedom Fighters], 1960. 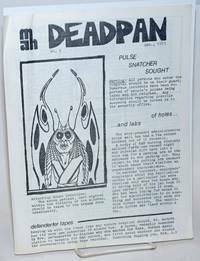 Single issue of the 8.5x11 inch, crudely mimeographed newsletter, two pages plus cover, with a rubberstamp on the cover, "Second edition." Mlot-Mroz was a vocal anti-Semitic activist, head of the self-proclaimed Polish Freedom Fighters. Contents devoted entirely to a screed against the Satanic-Communist Jewish conspiracy, titled "I dream about the defeat of atheistic Jewish-Communism.